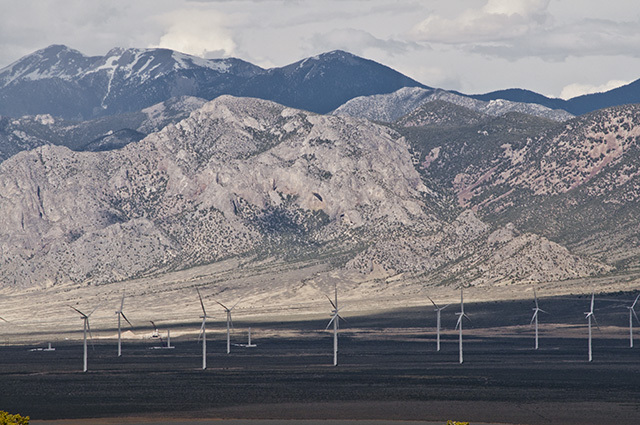 The project to install 66, 275 foot tall wind turbines directly below the heights of Great Basin National Park, Nevada is now well underway as the April 22, 2012 photo shows. Nevada’s first wind farm, which will disturb almost 15 square miles, was approved by the BLM without even an environmental impact statement. It impinges on the ice age relict Swamp Cedar National Area sacred to the Western Shoshoni tribe. Great Basin National Park celebrates the Snake Mountain Range, topped by 13,000 foot Wheeler Peak. The wind turbines also block much of the highway view of the Mt. Moriah Wilderness area, also in the Snake Range, but a bit further north. While wind turbines do kill birds, they are especially hard on the vital insect-eating bats. The bats do not get chopped up in the turbine blades. Instead the bats explode after they pass the turbine blades and move into the low pressure area behind them. It turns out the Spring Valley turbines lie right below the Rose Guano bat cave (see photo) which briefly harbors as many as 3-million migrating bats in the fall. The project is slated to begin producing power in July 2012. The project is also expected to harm the imperiled sage grouse. These vulnerable slow flying birds will not tolerate living near tall perches for raptors, e.g., wind turbines. Back to the bats, most folks are aware they are in steep decline in the United States. The reason is the importation of deadly white nosed fungus from Europe. Bats eat an incredible number of insects. As such, they stand as yet one more fraying link between us and insect plagues and a host of insect borne diseases like West Nile Virus. The Western Watersheds Project and the Center for Biological Diversity tried to get the BLM and a federal district court to halt construction. A few changes were made to accommodate concerns. While the developer, Pattern Energy predicted that a couple hundred each of birds and bats would be killed, now they promise to actually monitor the number of deaths. Last night I watched the NV public television documentary about the SNWA water grab in Spring Valley and now to read this. I’ve been working all my life to hopefully purchase some land in White Pine county, but it seems every year the quality of life capable there is diminished by ill advised wind projects, water grabs and horrible quid pro quo wilderness bills that destroy roadless areas and sell of public land. The migrating bats and local avian population will certainly see reductions in their survival rate due to the wind turbines. Is anyone besides the Toiyabe chapter of the Sierra Club and WWP even attempting to defend NV’s public lands anymore. The Silver State is the state I love and it saddens me to see so much pillaging of it, especially in the eastern portion of the state last decade. Nevada is still considered the state least impacted by humans…let’s keep it that way. In the case of SNWA and the “Water Grab” they have spent the past quarter of a century analyzing and monitoring any potential imapacts their moving Spring Valley water might have on the environment and there is probably a very good chance that it will be another quarter of a century before a drop of water does head south. This wind project, just another example of green technologocal boondogglery, went up in less than a year with taxpayer subsidies on U.S. public lands, engineered and opperated by non-U.S. companies. All it will take is for one of these 400 plus foot tall reflections of a scene from “War of the Worlds” to overheat and explode and it will successfully do away with any further concerns over the environment in Spring Valley. Wind power advocates need to look more at vertical axis wind turbines.. I have seen photos of some that look mutch more appealing that the three bladed things in this article. Some of the vertical axis turbines look like they could be designed so that raptors could not land on them. I agree Larry. Why are they not as commercially popular as the three bladed turbines? Do they just not create enough torque to drive the generator? And they would be much more bird/bat friendly than what we have now. So, they’ll complete this monstrosity, bring it on-line, and then “monitor” the carnage. And if the estimate of mortality turns out to be low by an order of magnitude, will any agency functionary have the guts to shut it down? When swine soar among the blades. After all, once it’s built, it’ll be “too expensive” to mothball it. When will Westerners wake up and realize that we’re just one big energy colony? Bats don’t “explode” as they pass through wind turbines. This is a gross exaggeration. For facts about bats and wind energy, go to http://www.batsandwind.org. Disclaimer, I am a conservation biologist working for Bat Conservation International, one of the BWEC partners.